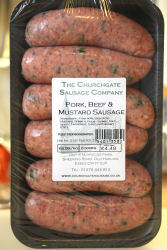 We've tried many of the sausages made by Jason Drage of the Churchgate Sausage Company and all of then have been top notch, but these have been the ones we've liked the best so far. Usually we talk about the products before we make statement like this but these Pork, Beef & Mustard really hit the mark. The combination of 40% pork and 40% beef really do provide a wonderful meaty balance, but then add some bread crumbs and mustard plus a few bits of spinach leaf too and what have you got? You've got a stonkingly good sausage! We were so impressed with these, we gave a pack to senior family members to try and to give us their own views...all they said in a slight Suffolk lilt was "those sausages were bootiful". So a result all round then! 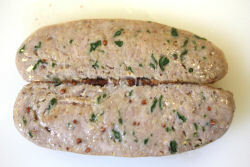 A very well made and balanced sausage that hits the top of the charts. 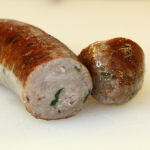 Jason Drage of the Churchgate Sausage Company certainly knows his stuff when it comes to sausage making. You've just got to try these. 110x30mm before cooking, 105x30mm after. 83g before cooking, 79g after. That's a shrinkage of 5% & weight loss of approx 4%.